The Canadysli Guggemusig Band inspired by the Mortestraich Festival in Basel, Switzerland, parades at 7am, yes 7 in the morning. The band is inspired by the parade in Basel, Switzerland. 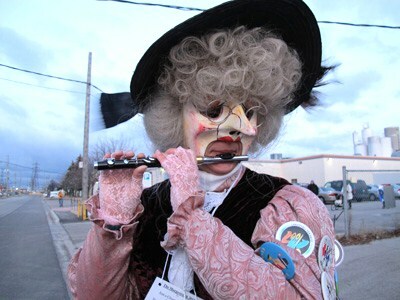 Few people know of its Toronto existence and these musicians who are mainly of Swiss origin dress up in carnival costume and march around the block for fun. They also perform indoors. The restaurant serves Swiss food.